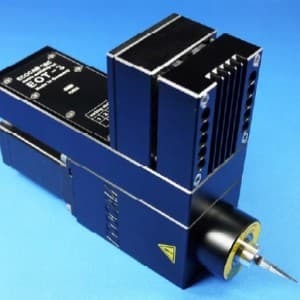 ECOCAM Electrically Oscillating Tangential Knife EOT-3 | DamenCNC B.V.
ECOCAM is introducing a new electrically oscillating tangential knife: the EOT-3. The most important improvement refers to the kinematic system of the tangential oscillation axis. Axial, radial and torsional stiffness as well as wear resistance is optimized. The outside dimensions and the fixing points have not been changed, the integrated new electronic system is compatible with the previous one and all accessories and blades are compatible with the new system.